The Exhibition continues until Saturday 21st March 2015. Mr.Turpin sings the Blues, the Yellows and the Reds. He sees off the pretenders with his polychromatic big scatter gun pulled from the paint box. The gardens are his – the grand gardens, the planned gardens and the manned gardens; they are all his. Don’t even think about muscling in. I am great friends with Louis ‘cos I never once muscled in. I’ve seen him unlock the paint box (Is that a Pandora I see before me?) and the room lights up. Colours bigger and brighter than nature itself spread in organised swathes throughout his canvases. The garden in so many ways is not an easy subject. So many have gone before celebrating (or not) man’s subjugation of nature. Having lost Eden, mankind has the ceaseless desire to recreate a half remembered paradise from before the Exodus. The Persian perfumed plot circled by walls holding back the desert; Glover, the C18th painter, hoeing out a soft semi-tropical patch in Tasmania; in the Americas, stockades and cactus hedging protecting the flora within and in Europe the watchword Order produced gardens for artists to paint. 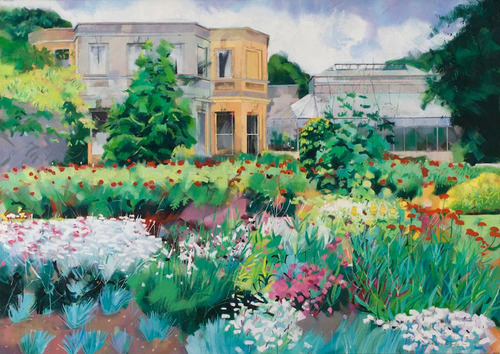 Turpin is in good company; Monet sets out Giverny; in England Ivan Hitchens slashes out with broad speedy strokes – although he seems to give up round about tea-time. Louis is fearless with his colour palette and over five decades he has learnt to herd prickles and spikes with the cotton wool and the cloudless cerulean with regal cerise. His innate graphic strength tightens where it must and drifts where it must. 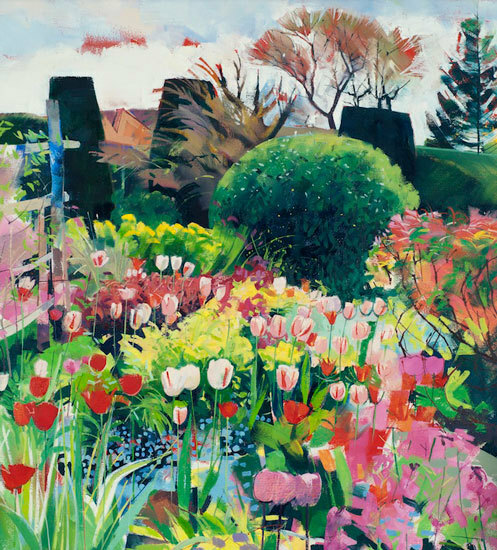 His Motifs (to use that Impressionist word) create condensed gardenscape portraits. When at times Mr.Turpin puts away the shiny tubes of colour, they must first be caught and corralled. After the cacophonous pigments have quietened down he will, like an Oriental scribe, arrange the simplest of implements – paper, black ink, pen and brush in readiness for the floating world in all seasons. I do like his direct, concentrated black lines on their journey across white paper. The plump wash-loaded brush reminds me of the Japanese poet monks’ calligraphic sureness. Simplicity and explanation on a square of paper is hard to achieve but Louis has its measure. Beyond the garden lies the familiar Kent-Sussex land of marsh, sheep pasture and the sea’s edge. Turpin has sat amongst it for a lifetime. Though the places painted have names or titles, they are really about the artist keeping in touch with his world. The portraits of family, friends and commissions seem to fit into a more private place. When the sitter has gone the artist remains with memory, some sketches, photos, familiar items and continues to work. Once or twice the sitter has caused trouble but Big Louis knows where they live. But as I say, Mr.Turpin is ninety-nine percent totally benign, his apricot toned linen trousers attest to that. He picks up his guitar and quietly sings The day I put your picture in a frame.